During one of my mid-day walks with Will, we headed to the library to find some good reading material on how to start a family while cutting back financially. 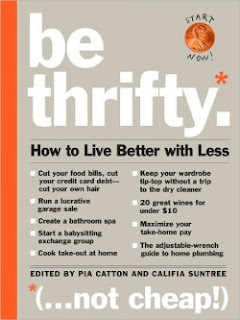 While I didn't find exactly what I was looking for (maybe I should take a stab at writing a guide myself...), I did find a few good books on frugal living that I brought home and devoured from cover to cover. From olive oil hair treatments to reusing vacuum bags, below are some of the best tips that I've either implemented or filed away for future use. Cutting my husband's hair. We bought a $20 Wahl clippers from Amazon and I've cut his hair for 6 months now. That's already a savings of at least $80 given he used to have his hair cut every six weeks. After getting over his initial fear of being my next DIY project, I think he secretly likes it...no hassle to get to the barber shop anymore. And honestly? No one can tell the difference. Cooking more often with dried beans, which are SO much cheaper (and more delicious!) than their canned counterparts. There is a great chart with some quick tips for soaking and cooking different types of beans, including a quick soak method I've already used a few times when I've forgotten to soak beans overnight (put beans in water, bring to a boil, cover and turn off heat and let soak for an hour). I used to have no luck with beans - they would be one of two extremes, burned or rock hard - but with the help of this book I've managed to overcome my bad bean karma. Making our own cleaning supplies. I've been using vinegar and water for a while now on my countertops, but after reading this book and articles in Natural Home and Urban Farm magazines, I've been inspired to switch up my whole cleaning regimen and go the natural (and cheap) route. This weekend I'm picking up washing soda, Borax, grapefruit essential oil and other supplies at the store. Let the experimenting begin (and let's hope that there are no explosions). Leftover rice? Make rice pudding. If you get paid bi-weekly, twice a year you will get three paychecks in a month. Instead of allowing that third one to get eaten up by expenses, as soon as you receive it put it into a savings account or allocate it towards one of your goals. Make a hot oil treatment for hair: Empty out a travel-size shampoo bottle and fill with olive oil. Drop into a hot bath to warm. Put on hair for 10-15 minutes under a shower cap. These are just a few of the 'pearls of wisdom' I gained from these two books. If you are of thrifty mind, I am sure you would find the time reading them to be well spent!